If you’re looking for a price drop on drop-tops, you might want to explore the best used convertible cars under $20,000. They’re less expensive than brand-new alternatives, but just as much fun to drive. For example, if you’re interested in classic American muscle, we’ve got options from the Blue Oval and the Bowtie brand alike. We’ve also found a variety of imports that are specifically known for their hot handling. On the topic of warmth, some entries offer heated seats to extend the open-air driving season. And even though most of these cars help keep their prices down by using soft fabric roofs, there is a power-retractable hard top on our list. In any case, all of these cars feature a broad range of other content as well. We could have newer Camaros for our gallery of the best convertible cars under $20,000. However, there is a method to our madness: Going back to the 2016 Chevrolet Camaro lets you afford a crazy-powerful SS model. With that trim, you not only get to drop the top, you also can drop the hammer on your rivals with a 6.2-liter V8. That engine delivers 426 hp and 420 lb-ft of torque with a standard six-speed manual transmission, or 400 hp and 410 lb-ft of torque with the optional six-speed automatic. Regardless of transmission, a rearview camera, 20-inch aluminum-alloy wheels, and Brembo brakes are standard. 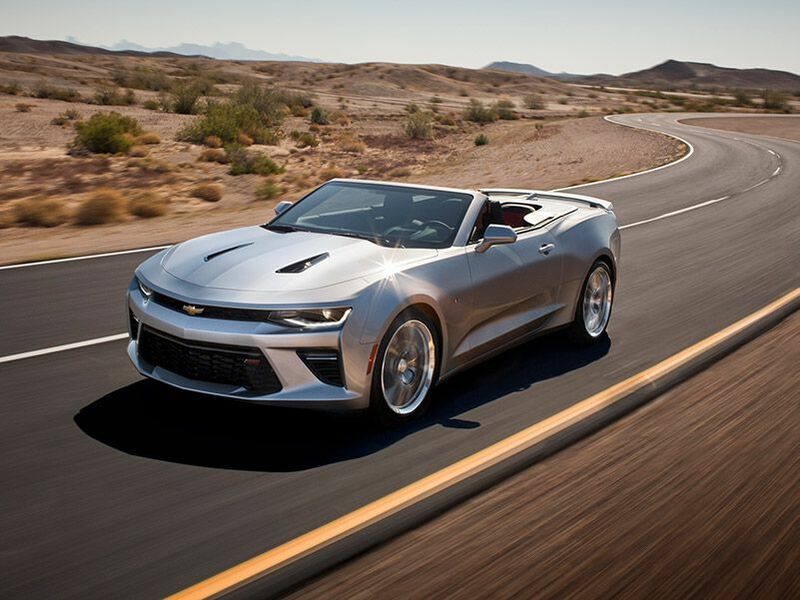 The Camaro SS tops things off with a power-retractable soft roof that’s available in black or beige. The best used convertible cars under $20,000 also include the Camaro’s arch-nemesis - the Ford Mustang. But we’ve selected a more recent Mustang to show off another side of the modern-day muscle cars. 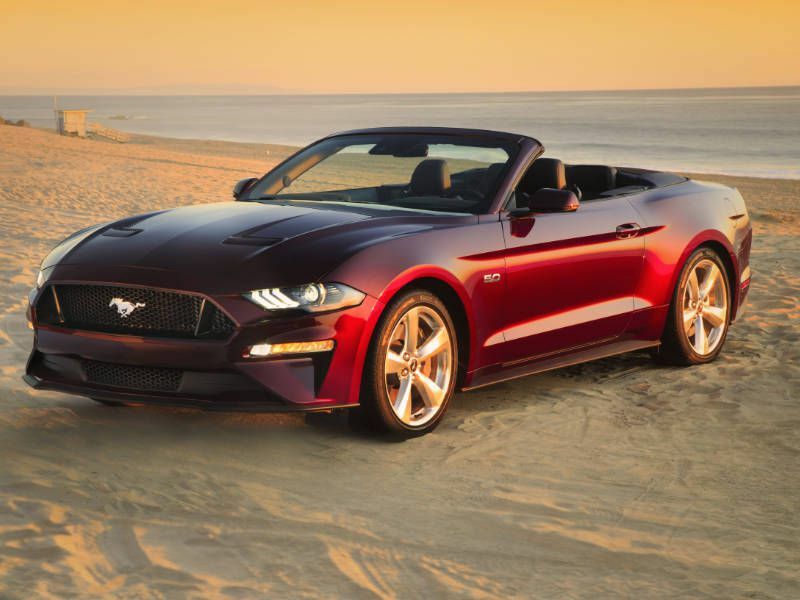 To be exact, we recommend the 2018 Ford Mustang convertible in its EcoBoost Premium trim. This lets you tap into a turbocharged engine that makes 310 hp and 350 lb-ft of torque. You also get to make the most out of that powerplant with a standard six-speed manual transmission, a limited-slip rear differential, and a multimode drive system so that you can fine-tune your fun. It has Sport+, Track, and Drag Strip settings. The car lives up to its Premium positioning with leather-trimmed climate-controlled front seats, a power-retractable soft top, Android Auto, and Apple CarPlay. 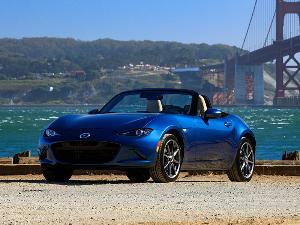 The 2017 Mazda MX-5 Miata is another sporty option among the best used convertible cars under $20,000. 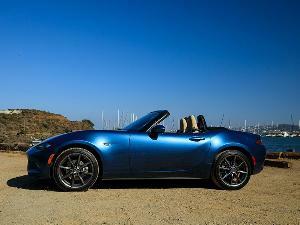 Now, the Miata isn’t as powerful as those first two muscle cars, yet it does boast razor-sharp handling. 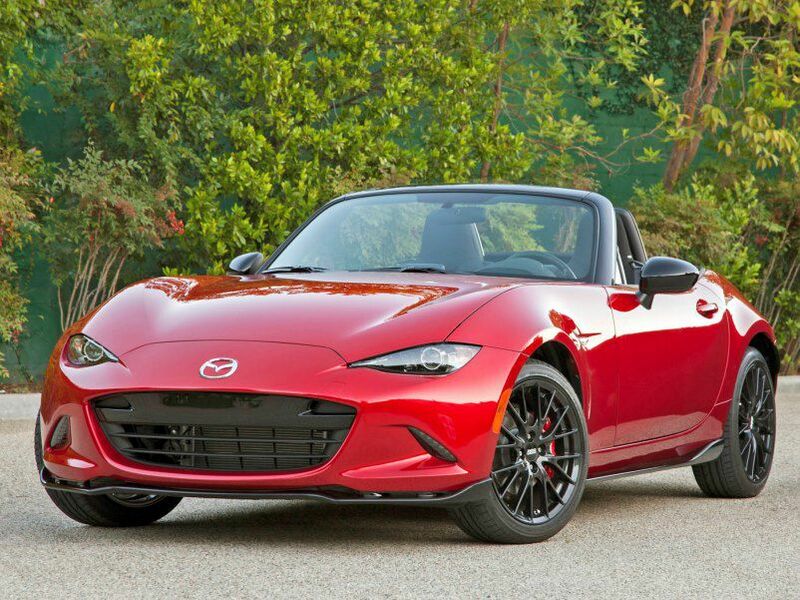 The Miata’s nimble dimensions and wide-open cabin also ensure one of the most exciting convertible driving experiences you can get at any price. Mazda makes it easy to work the top, too. The soft roof can be open or closed with just one hand - and without leaving the cockpit - thanks to built-in assist springs. You also can enjoy equipment specifically designed to optimize open-air driving. This ranges from heated front seats to keep you warm on chilly days, to a Bose audio system with speakers built right into the Miata’s headrests. 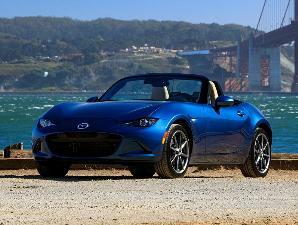 Let’s say you like the basic package you get with the Mazda Miata, but you’d prefer turbocharged power and Italian flair. Well, so does the team at Fiat. 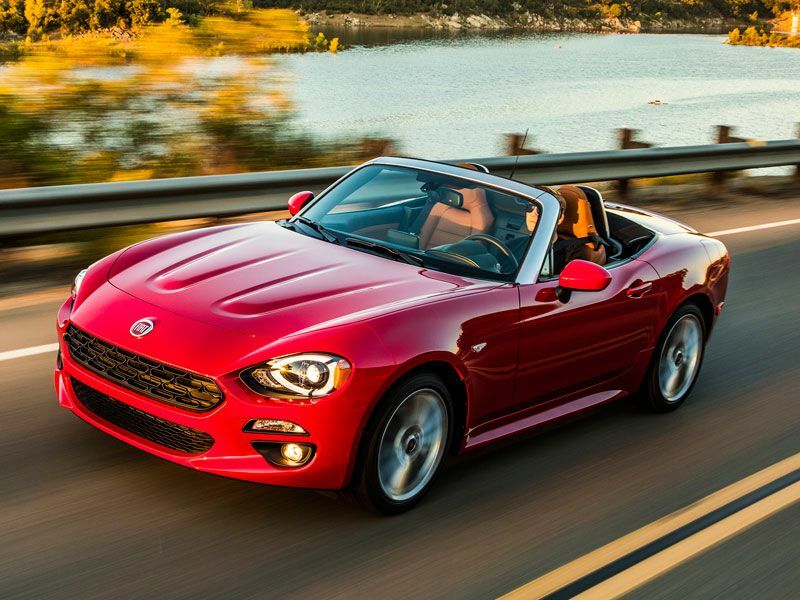 That’s why we’re putting the 2017 FIAT 124 Spider with our best used convertible cars under $20,000. 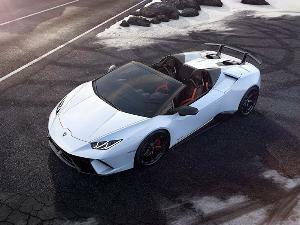 Although it shares a name with an iconic Fiat sports car of years past, the 2017 124 Spider is built on the same platform as the Miata. 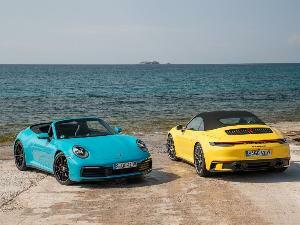 The two cars also rely on the same convertible top system and soft fabric roof. The key difference: Instead of Mazda’s naturally aspirated 2.0-liter four-cylinder engine, which produces 155 hp and 148 lb-ft of torque, Fiat provides a 1.4-liter turbo with 164 hp and 184 lb-ft of torque. Volkswagen has two of the best used convertible cars under $20,000, and they start with the 2017 Volkswagen Beetle. The Beetle is backed by one of the segment’s fastest-operating power-retractable soft tops: It can open in just 9.5 seconds, even if you’re driving at speeds of up to 31 mph. The 2017 model year also happens to be an especially notable one for the modern-day Bug. The Dune model debuted that year, with inspiration from classic VW dune buggies of the 1960s and 1970s. 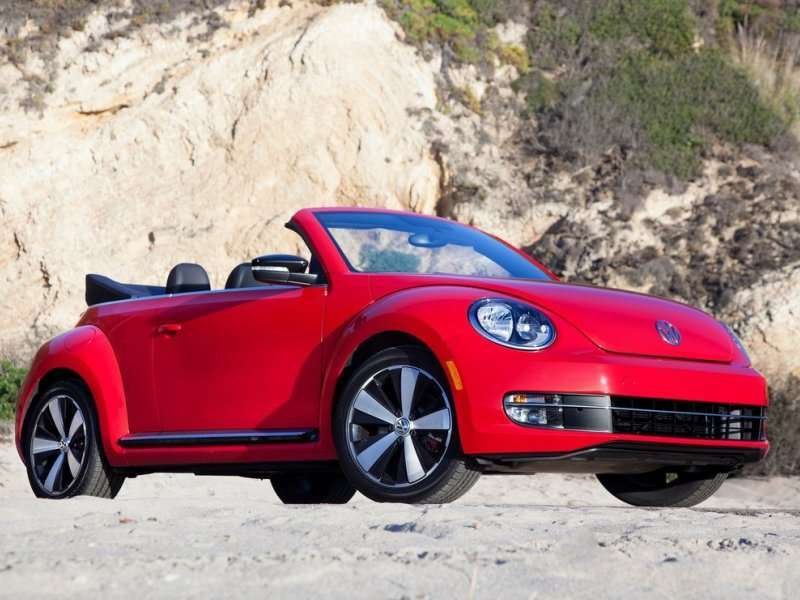 The 2017 Dune convertible brings off-road-style fascias, a wider body, a higher ride height, sport seats, special 18-inch wheels, and some of VW’s top infotainment technologies. These range from a Fender audio system to Android Auto/Apple CarPlay smartphone integration. VW also has a metal-roofed model in our gallery of the best used convertible cars under $20,000. 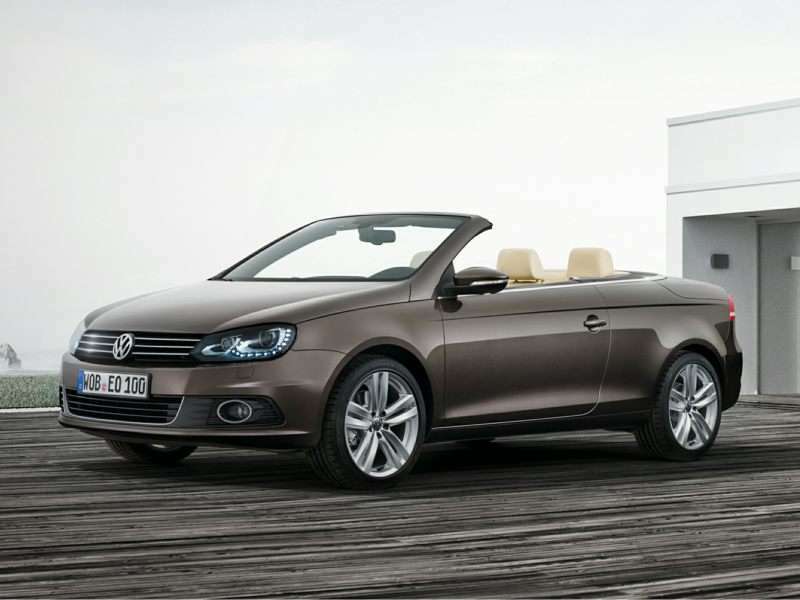 The Volkswagen Eos was in production up to 2015, with a certain number of unsold entry-level cars offered for 2016. Yet even that 2016 “Komfort” trim comes with a power-retractable hardtop that folds away in 25 seconds. Surprisingly, a panoramic sunroof is standard at the same time, so you also can go open-air driving with the top up. Don’t worry about the car’s entry-level status, either. The Komfort models still have niceties like heated front seats, a 12-way power-adjustable driver’s seat, dual-zone automatic climate control, Bluetooth, and a peppy 2.0-liter turbocharged engine. It serves up 200 hp and 207 lb-ft of torque through a six-speed dual-clutch automatic transmission. Many of the best used convertible cars under $20,000 are on the small side, and that definitely applies to our next entry. 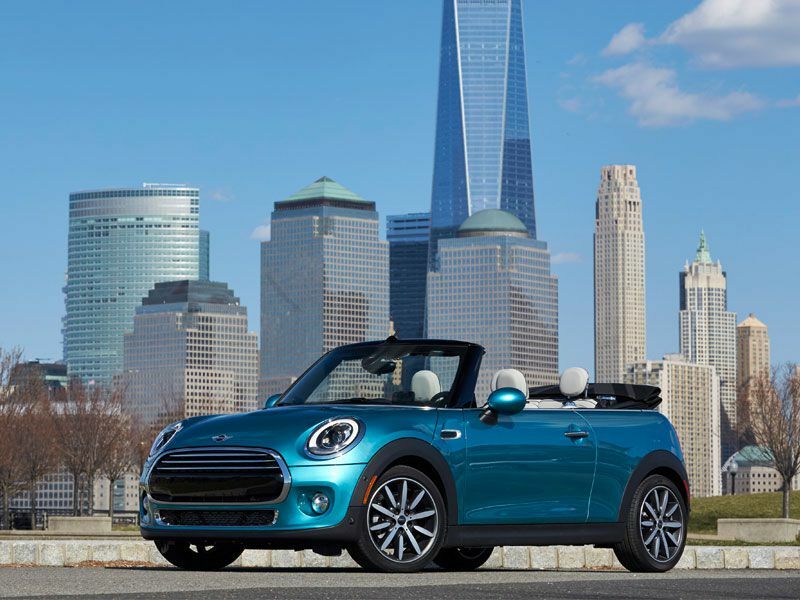 The 2016 MINI Cooper Convertible is about 10 inches shorter than a Honda Fit. On the other hand, the car does have room for a standard power-operated soft top. For performance, the standard three-cylinder engine uses TwinPower turbocharging technology to provide 134 hp, 162 lb-ft of torque, and a top speed of 128 mph. Since our $20,000 budget can cover a Cooper S Convertible, you also can step up to a four-cylinder TwinPower turbo engine. The bigger engine belts out 189 hp and 206 lb-ft of torque for a top speed of 143 mph, all with a 0-60 time of 6.7 seconds. 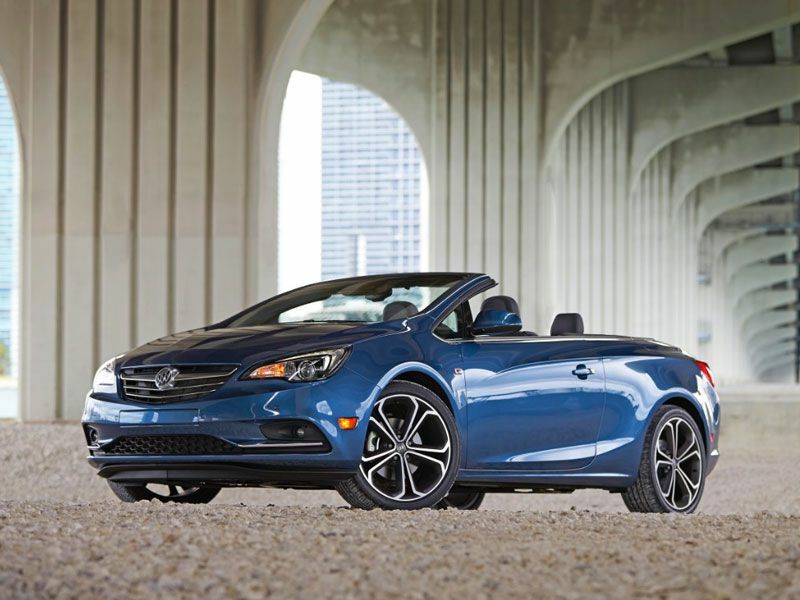 For premium style, the best used convertible cars under $20,000 include the 2016 Buick Cascada. 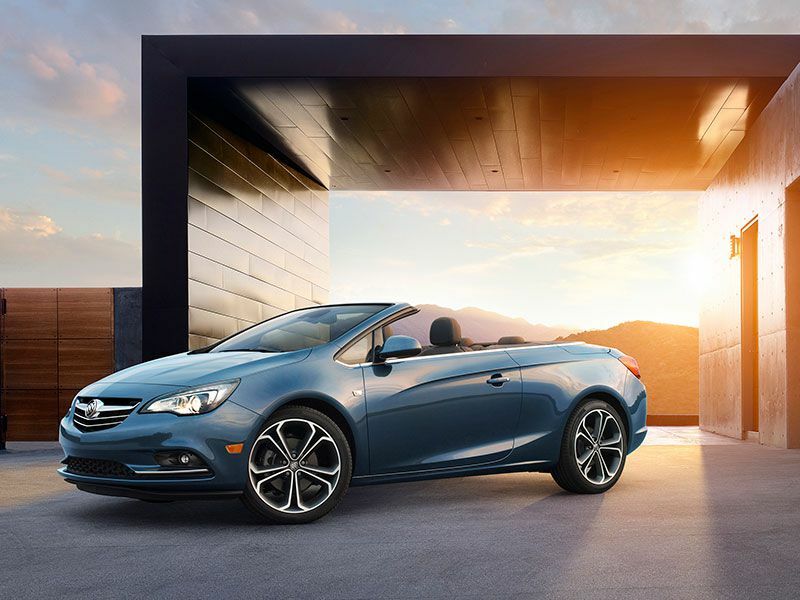 The Cascada has a sporty, European design with a driver-focused cockpit and a driver-friendly turbocharged engine. It supplies 200 hp and 207 llb-ft of torque in normal driving circumstances, but there’s also an overboost function for when you need an extra burst of torque - up to 221 lb-ft in total. A power-retractable soft roof is standard, as are heated front sport seats. Those are handy if you want to drop the top when the temperatures fall. The Cascada further stands out with its technologies. A $20,000 budget is enough for mobile Wi-Fi, forward-collision alert, lane-departure warning, a rearview camera, and front and rear parking sensors. We also delve into premium territory with cars like the 2015 Audi A3. 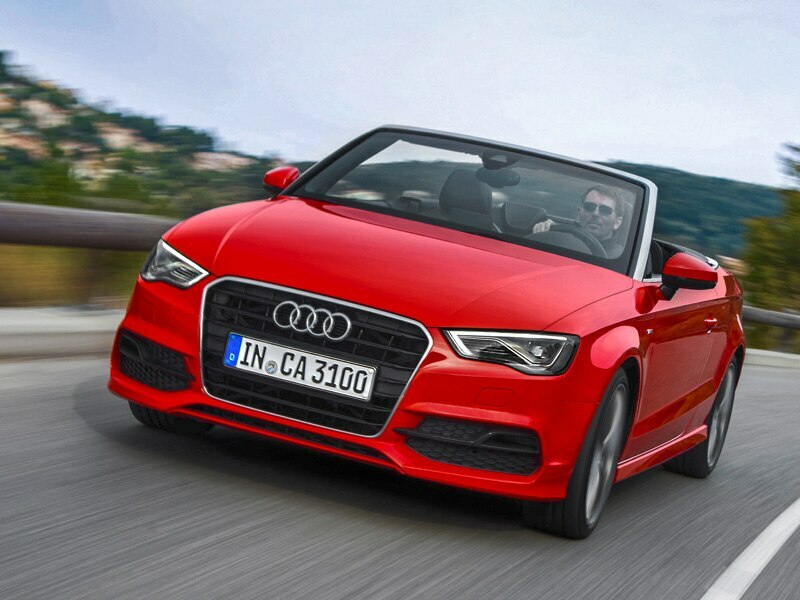 Like many of the best used convertible cars under $20,000, the A3 Cabriolet is capped by a power-retractable soft top. The premium part of the package is on display from the driver’s seat, which offers 12-way power adjustability, leather seating surfaces, and access to a sport-style multifunction steering wheel. The A3 shines on the outside with standard xenon headlights, LED daytime running lights, and LED taillights. The A3’s powertrain also is a relatively upscale setup, and includes a six-speed dual-clutch automatic transmission and a turbocharged engine with 170 hp and 200 lb-ft of torque. Audi’s nine-speaker Concert audio system with HD Radio helps complete the picture. It turns out that many of the best used convertible cars under $20,000 have German roots. Along with the two Volkswagens, the Buick rides on an Opel platform, and the Mini features BMW engines. In fact, the MINI brand is owned by BMW. But we also have an actual BMW here. 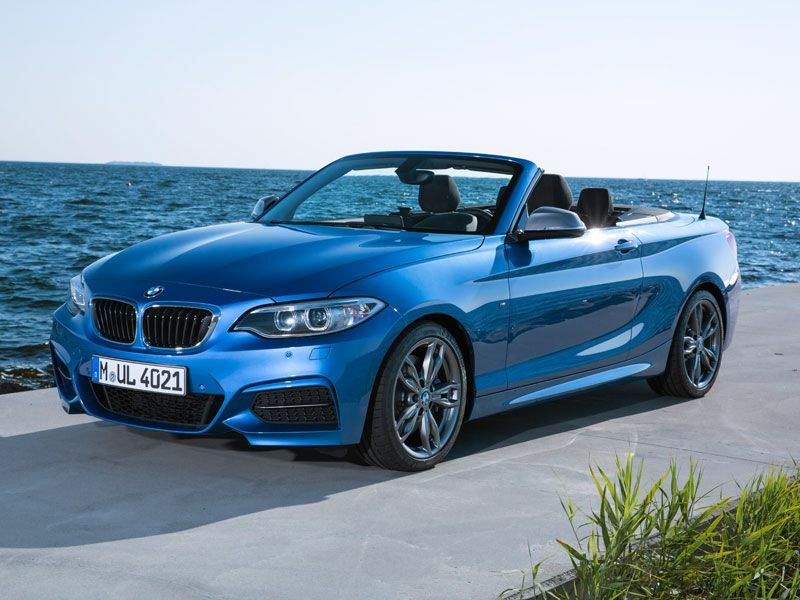 The 2015 BMW 2 Series qualifies with the expected power-retractable soft top and unexpectedly high levels of performance. The 228i, which is the most likely model you’ll find below $20,000, combines rear-wheel drive and a turbocharged engine that’s good for 240 hp and 255 lb-ft of torque. As a result, it can hit 60 mph in only a bit more than five seconds. Heated seats and Harman/Kardon audio add a touch of luxury.